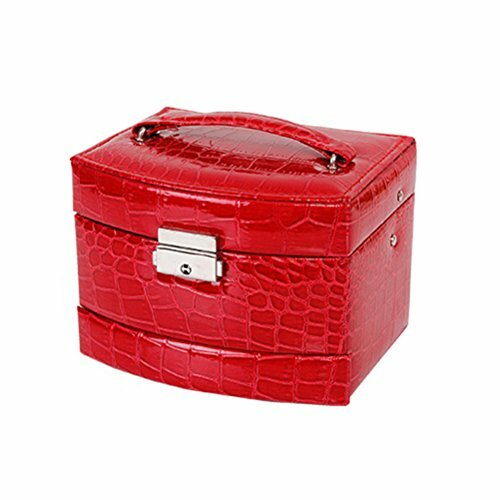 This jewelry box is designed with premium PU leather housing for durable use and crocodile pattern for elegant looking. Its interior is made with soft velvet to keep your jewelry from scratches and dust. The jewelry box is equipped with 3 layers sperated drawers, each drawer is composed of different compartments. This desktop organizer can be used to store and classify your jewelry and cosmetics. Handle on the top for convenient carrying and lock design for extra security. - High quality material with strong body construction for durable use. Wear and scratch resistance. - Eelgant crocodile pattern design and fine workmanship. Can be sent as fashion and chic jewelry gift box for friends and families. - Large capacity with lots of compartments for loading various cosmetics, rings, earings, necklaces, bracelets and other small ornaments and jewelry. - Ergonomic and practicaldesign with a handle for easy carrying. High quality material with strong body construction for durable use. Wear and scratch resistance. Eelgant crocodile pattern design and fine workmanship. Can be sent as fashion and chic jewelry gift box for friends and families. Large capacity with lots of compartments for loading various cosmetics, rings, earings, necklaces, bracelets and other small ornaments and jewelry. Ergonomic and practical design with a handle for easy carrying. Equipped with lock and key, very safe and convenient.